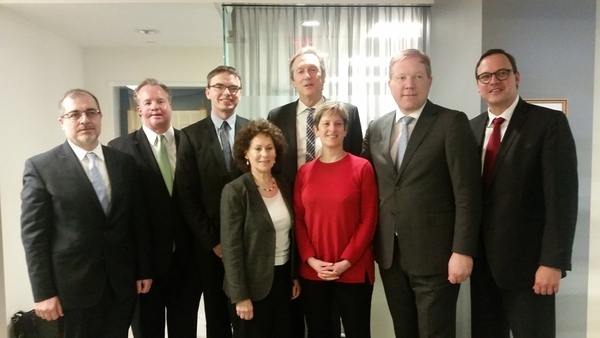 On Tuesday, NCSEJ hosted a meeting for representatives of the member agencies and the United States Holocaust Memorial Museum with current and former Chairmen of the Foreign Affairs Committee of Estonia’s Parliament Sven Mikser and Marko Mikhelson, and Estonia’s Ambassador to the U.S. Eerik Marmei. Issues discussed included the situation in the Jewish community of Estonia, the country’s relations with the U.S. and Israel, and the ongoing challenges stemming from Russia’s actions in the Eurasia region. Also this week, NCSEJ hosted members of the diplomatic corps at a baseball game at Nationals Park. In a suite donated by the law firm Foley & Lardner, we were joined by the Ambassadors of Estonia and Ukraine and their families, the Deputy Chief of Mission from the Embassy of Israel, and the two visiting Estonian parliamentarians. This was the first baseball game for most of our guests and it was a pleasure to introduce this American pastime to our Embassy friends. On Thursday, Ukraine’s Parliament appointed a close ally of Petro Poroshenko, Yuriy Lutsenko, as general prosecutor. Yuriy Lutsenko is a former interior minister and head of Poroshenko's parliamentary faction. The previous prosecutor, Viktor Shokin, was removed from the position last month, after being widely criticized for impeding reforms. Ukraine’s progress and much needed disbursement of foreign aid continues to depend on the country’s ability to implement judicial reform and anti-corruption initiatives. I want to congratulate David Schizer, who has been selected as the new CEO of the American Jewish Joint Distribution Committee (JDC). NCSEJ has had a long, close partnership with JDC, and I look forward to working with David. I want to highlight an op-ed by William Pomeranz and Matthew Rojansky of the Wilson Center about the need for structural reforms and an anti-corruption strategy in Russia. The authors analyze anti-corruption strategies undertaken by the Russian government, and argue that unless corruption is addressed, Russia’s economic situation will continue to worsen. NCSEJ will feature U.S. Senator Chris Murphy (D-CT) as the keynote speaker at our Board of Governors meeting on Tuesday, June 7. We’ll also have a panel with Deputy Assistant Secretaries of State Bridget Brink and Kathleen Kavalec, a panel with Jewish community leaders from Georgia, Moldova, and Lithuania, and much more. Please click here to register. Limmud FSU, in partnership with the government of Belarus, the Belarus Jewish community and the Israeli Embassy of Belarus in Minsk, is convening the first Limmud FSU conference to be held in the capital this May 13-15. With more than 750 participants from across the country, Limmud FSU Belarus promises to be the largest and most significant Jewish event locally in recent years, providing Belarus Jews an unprecedented cultural, educational, communal, and social experience. Legislation making it easier for Holocaust survivors to press restitution claims passed in Romania’s Parliament on Tuesday. The law prioritizes the processing of claims belonging to Holocaust survivors, the World Jewish Restitution Organization, or WJRO, wrote in a statement applauding the legislation . Iran's army is now equipped with a Russian air defence system after a long and controversial delivery process, Defence Minister General Hossein Dehghan was quoted as saying Tuesday. "I inform our people that... we are in possession of the strategic S-300 system" and that it "serves our air force's counterattack command," Dehghan said, according to ISNA news agency. Parts of the system, including missile tubes and radar equipment, were displayed on April 17 during a military parade in southern Tehran. The United States and Israel have criticised Russia for the sale of the S-300 system to the Islamic republic. Tehran says it is needed to strengthen its air defence against possible attacks, including on its nuclear facilities. Two U.S. congressmen have introduced legislation aimed to establish government strategy aimed at combating “foreign disinformation campaigns” they say are being waged by Russia and China. The bill, announced May 11 by Republican Adam Kinzinger and Democrat Ted Lieu, mirrors one introduced earlier this year in the Senate, and underscores the concerns U.S. lawmakers have about what many perceive to be government propaganda from Moscow and Beijing. A leading Russian lawmaker, Konstatin Kosyachov, meanwhile, likened the U.S. efforts to those of the Soviet Union. Ukraine's resistance to allow civil society experts to play a role in establishing the anti-corruption bureau remains “a major source of contention,” the International Monetary Fund said in a staff discussion note published Wednesday. “I am concerned about Ukraine’s slow progress in improving governance and fighting corruption, and reducing the influence of vested interests in policymaking,” the IMF Managing Director on Ukraine said in a February press release. Russian prosecutors have asked at least two state-owned companies to provide information about possible illegal actions taken by opposition leader Aleksei Navalny, who says he believes similar requests have been sent to several other companies targeted in his anticorruption investigations. In a letter dated April 28, a senior Prosecutor-General's Office official asked the general director of state-controlled airline Aeroflot to provide "information about any illegal actions committed" by Navalny, according to a scan of the letter that Navalny published on his website on May 11. An unidentified source in the Prosecutor-General's Office confirmed the authenticity of the letter, according to the daily RBK newspaper, which reported on May 11 that an analogous request had been sent to state-owned oil major Rosneft. Navalny, who previously served on Aeroflot's board of directors, built his reputation as a relentless anticorruption crusader through his investigations of alleged graft at state-owned firms in which he was a minority shareholder. More than 1,300 servicemen and 30 military vehicles took part in the Victory Day parade in the Crimean port of Sevastopol, Russian state news agency Interfax reported. The parade included S-300 anti-aircraft missile systems and other hardware, namely Russia's newest armored vehicles, Interfax reported Monday. World War II veterans also marched through Sevastopol's central streets. A similar parade took place in the Crimean city of Kerch. According to Sevastopol's local news website, thousands of people from Crimea and Ukraine gathered to watch maritime maneuvers in Sevastopol Bay, the city's harbor. They were reportedly able to take boat rides to observe the ships and a Russian submarine, docked in the area, up close. If one were to merely follow national politics in Ukraine, it would be easy to become discouraged about the state of reforms. Headlines from top media suggest that Ukraine’s longstanding oligarchic power structures and institutionalized corruption have persisted in the wake of the Revolution of Dignity, frustrating citizens and the international community. Indeed, the many criticisms of President Petro Poroshenko and parliament are not unfounded. A recent national survey conducted by the International Republican Institute (IRI) found record-level public dissatisfaction regarding the country’s overall direction—a level of frustration that rivals the pre-Maidan period. Seventy-six percent of Ukrainians told pollsters the country was headed in the wrong direction in February 2016. Similarly, as previously reported, IRI’s March 2016 nationwide municipal survey, which contains the perceptions of more than 19,000 Ukrainians from twenty-four major cities, revealed that more than 90 percent of Ukrainians believe corruption is a significant or serious problem in their community, and frustration with Poroshenko and the parliament stands at troubling levels. The American Jewish Joint Distribution Committee (JDC) is delighted to name David Schizer as its next CEO. Schizer – the Dean Emeritus of Columbia Law School and a noted Jewish community leader – will take the helm of the global Jewish humanitarian organization on January 1, 2017, pending his approval by the JDC Board at its regular Board Meeting next week. Succeeding Alan H. Gill as CEO, Schizer was unanimously nominated by a Selection Committee of JDC’s Board of Directors and confirmed by the Board’s Executive Committee after an extensive global search conducted by executive search firm Spencer Stuart. Ukrainian lawmakers on Thursday appointed a close ally of President Petro Poroshenko with no legal background as general prosecutor, a position seen by the West as crucial for Kiev's plans to tackle entrenched corruption. To shouts of "shame" from some lawmakers, Poroshenko told parliament that his ally, Yuriy Lutsenko, a former interior minister and head of Poroshenko's parliamentary faction, would build public trust in the prosecution service. The appointment may disappoint the European Commission, which like the United States and the International Monetary Fund, has tied aid to Ukraine to Kiev's performance on corruption and reforms. Brussels had urged Poroshenko to nominate someone seen as independent who had a legal background. The vote coincided with the visit of an IMF mission to Kiev for talks on disbursing a tranche of aid worth $1.7 billion. The foreign ministers of Germany, France, Russia and Ukraine reached several agreements Wednesday to improve security in the war-torn Donbas region, but failed to agree on holding elections in that part of eastern Ukraine, which is controlled by Russia-backed separatists. German Foreign Minister Frank-Walter Steinmeier, who hosted the talks with his three counterparts at a retreat near Berlin, told reporters after the meeting that there had been "clear progress" on the issue of security in eastern Ukraine, but no "breakthrough." "We reached progress in the security area but the political process remains difficult without a breakthrough today. A mixed progress, but I'm happy that Moscow and Kyiv were ready to work closer together today with the goal to keep the cease-fire," he said. Before gliding along trails or sliding down slopes, many of the world’s skis start at this bustling, sprawling factory in western Ukraine. Here, skilled machinists combine wobbly ribbons of carbon fiber and thin sheets of stiff titanium, stacking them like cake layers, and then heat-pressing, shaping and polishing them into finished slats for cross-country or downhill use. Here, too, craftworkers steam and bend wood into the sticks used by hockey players around the world under brand names that include Nike and Oxelo. The factory’s Austrian owner, Fischer Sports, pays employees the equivalent of about $307 a month on average — perhaps one-eighth the amount that skilled woodworkers and machinists might earn in Fischer’s home country. And since January, when a new free-trade pact between Ukraine and the 28-country European Union took effect, Fischer’s costs have been further reduced by the elimination of tariffs on the machinery and raw materials flowing into the country and the finished goods that are shipped back out. "As long as Iran continues to develop and deploy ballistic missiles, the United States will work with its allies to defend NATO," said U.S. Deputy Defence Secretary Robert Work, standing in front of the shield's massive gray concrete housing that was adorned with a U.S. flag. Thousands of soldiers marched through Red Square on May 9 to commemorate the 71st anniversary of victory over Nazi Germany. Though not as ambitious as last year's 70th jubilee, this year's Victory Day parade was designed to showcase the growing importance of the Soviet victory in World War II — and that of Russian military force — in Russia's current global agenda. The newly-created Military Space forces, the National Guard and female soldiers participated in the parade for the first time this year. Intercontinental ballistic missiles, 135 tanks and military vehicles, including Russia's newest S-400 anti-aircraft missile systems rolled through the city's streets and across the square. Seventy-one aircraft — including Sukhoi jets recently returned from Syria — flew overhead. It has been six years since Russia's World War II allies — the United States, Britain and France — sent troops to march alongside the Russian military on Red Square and German Chancellor Angela Merkel stood on the podium with Russian leaders. On 9 May – the Victory Day, as it is known in Russia – which commemorates the end of World War Two, I was looking through my Russian friends’ Facebook posts. Many shared photos of their grandparents, who fought in the war, inspired by the new tradition of “Immortal Regiment”, a peaceful march where ordinary Russians carry photos of war veterans. This year, the “Immortal Regiment” spread internationally with Russian expats marching in Prague, Jerusalem, New York, Toronto and even Brisbane. On Facebook, friends shared greetings, lyrics from old Soviet songs and happy memories about their grandfathers. The paradox of a Russian state that is outwardly strong but internally weak has persisted for centuries, from Ivan the Terrible to Mikhail Gorbachev. Vladimir Putin is the latest embodiment of this quintessentially Russian conundrum. Aggressive foreign policy has won him accolades at home and awed many around the world, yet he has been unable to influence Russia’s domestic development where it matters most for his own political fortunes — improving the daily lives of Russian citizens. Under Putin, the Kremlin’s primary response to the collapse of the Russian ruble, and with it public pensions and salaries, has been to advise people to get used to their new reality. A credible and thoroughgoing fight against corruption would be the necessary first step in structural reform that could jumpstart the Russian economy, as many economists have prescribed. The existence of corruption on a grand scale at the highest levels of government is not news in Russia. But even the basic tools or credible resolve to fight it are lacking. Absent a miracle, like the rebound of oil prices to $100 or more a barrel, Russia’s persistent failure to address corruption will exacerbate its economic woes.